Home › Services › Return of the Referencing Pop-Ups! Good referencing and citation can make the difference between a good mark and a great mark, so it’s worth taking some time over. Sure, there are apps and other shortcuts you *could* use, but when there are all-important marks at stake, why take the risk? Apps aren’t infallible, in fact some can be just plain wrong. And apps aren’t employed especially for you, to help with your referencing in your essay at your institution. Anyway, why use an app when there are friendly, knowledgeable staff just waiting for you to bring them your most complicated, obscure or frustrating referencing questions? I mean, you wouldn’t want them to feel unloved or lonely, would you? You see, the thing about librarians is that as well as helping you *find* the information you need, or access it, they’re also really into helping you use it. And this includes making sure you reference it properly. I’m not saying they’re totally nerdy or anything, but I have heard rumours that some of them even read the big (and I mean BIG) APA book for fun. So you don’t have to! They’ve created a brilliant referencing website, as well as guides to APA 6th, Vancouver and OSCOLA, condensing the lengthy manuals for each into handy leaflets. You can pick these up in the Library or download them from the Library website. They usually offer referencing help via email (library@port.ac.uk), online chat and at the support services desk. But for the next few weeks, because they know hand-in times are approaching, they’ve decided to run some more pop-up clinics in the Atrium. You can drop in between 11-12, 2-3 and 4-5 Monday to Friday to talk to them about anything that’s bothering you about referencing. 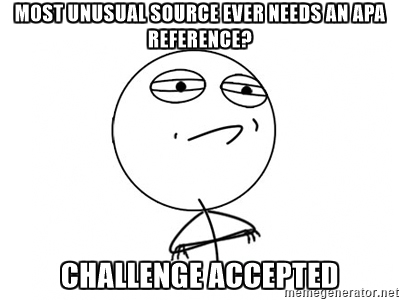 Whether it’s identifying what a source is, trying to decide which information you need to include, or working out how to format an in-text citation, they’ll be happy to help. We don’t want them feeling lonely at that little desk, so pop down to the pop up and keep them busy! Think most obsure thing I’ve been asked to reference was the tone on a phone ring.